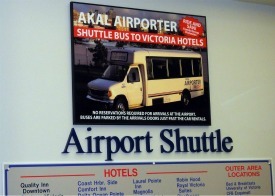 Akal Airporter - "Victoria Airport Shuttle"
Akal Airporter is an economical way of getting to downtown Victoria. It's 1/3 the cost of a typical taxi fare. Easier than taking public transport. There's no need to switch buses... With Akal, one bus takes you directly to downtown Victoria and drops you conveniently right at your downtown hotel. If you are traveling as a group (2 or more) additional discount also applies. I still remember the first time visiting Victoria. I was tired right after landing and didn't want to rent a car and drive into the city. This nice shuttle took me to the downtown hotel's doorstep ... What's more you can ask for? Next day, I rented a car from downtown... It was very simple and easy. The shuttle driver was a good tourist guide as well. He gave passengers a short description of the area, interesting places to go, and a few stories too. I really enjoyed my ride. Since then we have used their service several times. Frankly it is affordable, safe and a convenient way to downtown from the Airport. This shuttle service is a locally owned company. They provide vans and buses to and from Victoria Airport (YYJ) and to several other locations in Victoria BC. They have new air condition deluxe buses, vans and well-trained staff. If you are making plans to visit world famous Butchart Gardens ( which is 1/2 hour drive from downtown ) You can make a reservation for Butchart Garden tour with them too. They will come and pick you up from your hotel. They have a counter near the domestic baggage pickup area - It is very easy to find. You can buy tickets from the kiosk there. Are you traveling as a group or need to arrange a special trip? They offer discounts and special arrangements for groups too.